I have been meaning to post, but when I am at work, I don’t do much else. I am paid to be communicative there and have nothing left over for my personal life. I don’t see or speak to friends unless they initiate it, and I don’t feel like writing much either. This week a couple of things happened. Heather is fine. What used to be our car, is not. 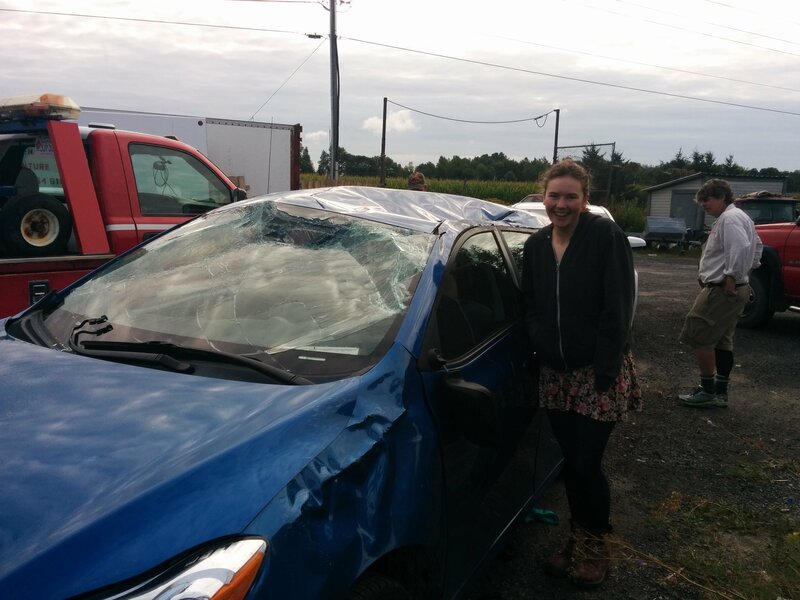 Thank goodness Heather is fine, not a scratch or a bump. Luckily they don’t make cars like they used to. Now you can roll one three times and the super structure will protect the driver as long as they are wearing a seat belt. I am looking into one of those skid schools so she can get back behind the wheel with some confidence. She is not up for it now and we don’t have a car for her to drive anyway. 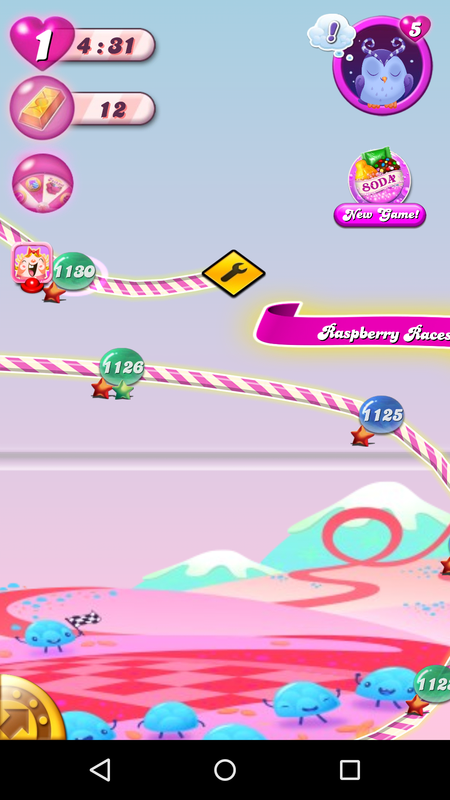 On a happier note, I finally managed to get to the final level of Candy Crush. I have been determined to join the 70% of players who don’t give King Games any money along the way. This extends the agony since you can buy your way through some of the harder levels with real-world purchased gold bars. I have an obsessive need to finish things I start, which is why I will finish the Barbara Walker project even though I am the only person on the planet who would possibly care (btw…I will post the latest few items on this set of days off). Sadly, it appears this victory was to be short lived, as they have already added another 15 levels yesterday. That is fine, I can pluck away at them as they come. I had a temporary hole in my life where Candy Crush used to live anyway…. This entry was posted in Uncategorized and tagged Candy Crush on August 27, 2015 by gillianknitter. OMG…what a terrifying experience. I’m glad to hear Heather is all right. Hope you are fine too Gillian…your heart must still be racing. Hi Gillian, so glad to hear that Heather is fine. Best wishes to your family. Thank goodness Heather is alive and well and able to tell the tale. The sooner she is able to get behind the wheel (whose ever that may be) the better. First time I had to drive after my car accident (DH told me I had to drive to the postoffice-7 minute walk-4 second drive when I insisted he needed to take me) I cried the whole way. Glad he made me though, as I fear I really wouldn’t have driven again otherwise. As for your BW creations—I care–I enjoy seeing what next will she create on her journey through BW’s pattern library! So glad Heather is ok. What an experience for you all. Can just imagine how you felt when you saw the car. You wonder how she walked away. Congratulations on finishing Candy Crush!!! Thanks. Since it happened, I have had a surprisingly large number of people at work tell me they rolled this or that car or truck and they all were fine…apparently it is getting t-boned you really have to worry about, but yes, it was scary to see the car. Thanks…I am glad to finish CC.